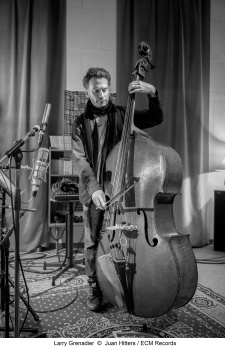 Over the decades, ECM has released a line of inventive albums showcasing solo double bass by such virtuosos of the instrument as Dave Holland, Barre Phillips and Miroslav Vitous. Now the label presents The Gleaners, the first album of solo bass by Larry Grenadier. As one of the most admired, accomplished bassists working in jazz today, Grenadier has been praised as “a deeply intuitive” musician by The New York Times and as an instrumentalist with a “fluid sense of melody” by Bass Player magazine. His personal tone has made him a bassist of choice for such artists as Paul Motian and Pat Metheny, not to mention some 25 years of deep, ongoing work in pianist Brad Mehldau’s widely influential trio. 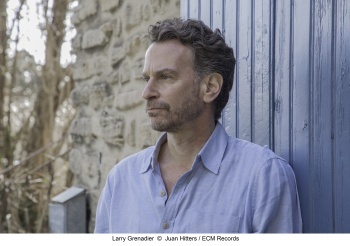 For ECM, Grenadier has featured on two albums as part of the cooperative trio Fly (alongside Mark Turner and Jeff Ballard), as well as three records led by guitarist Wolfgang Muthspiel. The Gleaners includes a brace of originals by Grenadier, along with distinctive interpretations of numbers by George Gershwin, John Coltrane and Motian. There’s also a pair of pieces written especially for Grenadier by Muthspiel, plus an instrumental interpretation of “Gone Like the Season Does,” a song by the bassist’s wife, and frequent collaborator, singer Rebecca Martin.